In a new study, researchers from MIT provide evidence that volcanic activity did indeed trigger the end-Triassic extinction, killing off 76 percent of marine and terrestrial species on Earth. More than 200 million years ago, a massive extinction decimated 76 percent of marine and terrestrial species, marking the end of the Triassic period and the onset of the Jurassic. This devastating event cleared the way for dinosaurs to dominate Earth for the next 135 million years, taking over ecological niches formerly occupied by other marine and terrestrial species. It’s not entirely clear what caused the end-Triassic extinction, although most scientists agree on a likely scenario: Over a relatively short period of time, massive volcanic eruptions from a large region known as the Central Atlantic Magmatic Province (CAMP) spewed forth huge amounts of lava and gas, including carbon dioxide, sulfur and methane. This sudden release of gases into the atmosphere may have created intense global warming and acidification of the oceans that ultimately killed off thousands of plant and animal species. 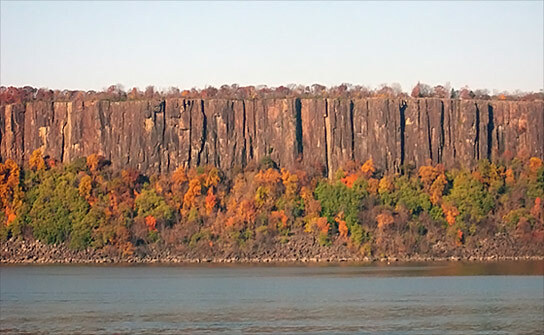 The team determined the age of basaltic lavas and other features found along the East Coast of the United States, as well as in Morocco — now-disparate regions that, 200 million years ago, were part of the supercontinent Pangaea. The rift that ultimately separated these landmasses was also the site of CAMP’s volcanic activity. Today, the geology of both regions includes igneous rocks from the CAMP eruptions as well as sedimentary rocks that accumulated in an enormous lake; the researchers used a combination of techniques to date the rocks and to pinpoint CAMP’s beginning and duration. From its measurements, the team reconstructed the region’s volcanic activity 201 million years ago, discovering that the eruption of magma — along with carbon dioxide, sulfur and methane — occurred in repeated bursts over a period of 40,000 years, a relatively short span in geologic time. The paper’s co-authors are Terrence Blackburn (who led the project as part of his PhD research) and Noah McLean of MIT; Paul Olsen and Dennis Kent of Columbia; John Puffer of Rutgers University; Greg McHone, an independent researcher from New Brunswick; E. Troy Rasbury of Stony Brook University; and Mohammed Et-Touhami of the Université Mohammed Premier Oujda in Morocco. The end-Triassic extinction is one of five major mass extinctions in the last 540 million years of Earth’s history. For several of these events, scientists have noted that large igneous provinces, which provide evidence of widespread volcanic activity, arose at about the same time. But, as Bowring points out, “Just because they happen to approximately coincide doesn’t mean there’s cause and effect.” For example, while massive lava flows overlapped with the extinction that wiped out the dinosaurs, scientists have linked that extinction to an asteroid collision. “If you really want to make the case that an eruption caused an extinction, you have to be able to show at the highest possible precision that the eruption of the basalt and the extinction occurred at exactly the same time,” Bowring says. In the case of the end-Triassic, Bowring says researchers have dated volcanic activity to right around the time fossils disappear from the geologic record, providing evidence that CAMP may have triggered the extinction. But these estimates have a margin of error of 1 million to 2 million years. “A million years is forever when you’re trying to make that link,” Bowring says. For example, it’s thought that CAMP emitted a total of more than 2 million cubic kilometers of lava. If that amount of lava were spewed over a period of 1 million to 2 million years, it wouldn’t have nearly the impact it would if it were emitted over tens of thousands of years. “The timescale over which the eruption occurred has a big effect,” Bowring says. To determine how long the volcanic eruptions lasted, the group combined two dating techniques: astrochronology and geochronology. The former is a technique that links sedimentary layers in rocks to changes in the tilt of the Earth: For decades, scientists have observed that the Earth’s orientation changes in regular cycles as a result of gravitational forces exerted by neighboring planets. For example, the Earth’s axis tilts at regular cycles, returning to its original tilt every 26,000 years. Such orbital variations change the amount of solar radiation reaching the Earth’s surface, which in turn has an effect on the planet’s climate, known as Milankovich cycles. The result of the climatic change can be preserved in the cyclicity of sediments deposited in the Earth’s crust. Scientists can determine a rock’s age by first identifying cyclical variations in deposition of sediments in quiet bodies of water, such as deep oceans or large lakes. A cycle of sediment corresponds with a cycle of the Earth’s tilt, established as a known period of years. By seeing where a rock lies in those sedimentary layers, scientists can get a good idea of how old it is. To get precise estimates, scientists have developed mathematical models to determine the Earth’s tilt over millions of years. Bowring says the technique is good for directly dating rocks up to 35 million years old, but beyond that, it’s unclear how reliable the technique can be. His team used astrochronology to estimate the age of the sedimentary rocks and then tested those estimates against high-precision dates from 200-million-year-old rocks in North America and Morocco. The researchers broke rock samples apart to isolate tiny crystals known as zircons, which they then analyzed to determine the ratio of uranium to lead. The painstaking technique enabled the team to date the rocks to within approximately 30,000 years — an incredibly precise measurement in geologic terms. Taken together, the geochronology and astrochronology techniques gave the team precise estimates for the onset of volcanism 200 million years ago, and revealed three bursts of magmatic activity over 40,000 years — an exceptionally short period of time during which massive amounts of carbon dioxide and other gas emissions may have drastically altered Earth’s climate, killing off thousands of plant and animal species. While the team’s evidence is the strongest thus far to link volcanic activity with the end-Triassic extinction, Bowring says more work can be done. Be the first to comment on "Volcanic Activity Triggered the End-Triassic Extinction"